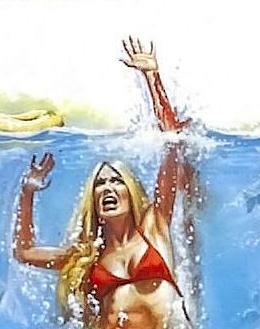 Digi-Schlock: PIRANHA (Shout! Factory DVD) – Schlockmania! Piranha has actually received a special edition before… and yet it still didn’t get the treatment it deserved in the U.S. The old New Concorde DVD boasted a nice set of special features thanks to the efforts of director Joe Dante and producer Jon Davison but had to make to do with the elements on hand for its transfer – namely, a washed-out looking open-matte presentation that appeared to be an old video master. A decent widescreen transfer was later made available via MGM’s UK branch but only region-free cinephiles could enjoy that. Fans will be happy to know that Shout! Factory’s new Piranha disc boasts a sharp new transfer and scads of extras including the goodies that appeared on the original New Concorde disc. First things first: this new disc features an anamorphic transfer that finally does justice to the film’s look. Jamie Anderson’s naturalistic approach to cinematography comes off nicely here and the lakeside locations look crisp and colorful. Even the deliberately murky underwater photography has a newfound clarity. The audio component of this transfer uses what is presumably the original mono mix (packaging doesn’t specify whether it is mono or stereo). In any event, it offers a clear, strong soundscape that uses Pino Donaggio’s score to nice effect. The producers of this disc have applied an equal amount of work to the supplements. Those who didn’t get the New Concorde disc way back when will be pleased to see its extras are preserved for posterity here. Carried-over supplements include some silent behind-the-scenes film footage shot by Davison (with him and Dante providing voiceover commentary) and a set of bloopers and outtakes. However, the best of the carryovers is a feature-length commentary track by Dante and Davison. Both are likeably self-deprecating and free with praise for their collaborators. Better yet, the two have highly detailed memories of the shoot and the result is a track that is bursting at the seams with witty production tales and all manner of fascinating scene-specific trivia. Highlights from this track include a story of how they duped the National Guard into assisting their shoot via a phony script and a hilarious tale about an unused sequence shot by Rob Bottin for the film that supplied one of the makeup-fx highlights. The disc also includes some noteworthy new features. The major inclusion is a 20-minute featurette that features Corman, Dante and several other cast and crew members discussing the history of the film. Dante interestingly reveals how ambivalent he was about the film until he started screening it for audiences and star Belinda Balaski tells a great story about how she used an effects-related trauma to increase her billing in the credits. Another new inclusion is a set of additional scenes used in t.v. prints of the film – a lot of them are scene extensions but they’re interesting enough for one viewing, particularly a scene where the main characters open up to each other about their love lives. Additional features include an extensive stills & press art image gallery, a set of trailers for other Shout! Factory New World releases and teaser & theatrical trailers for Piranha (the theatrical is available with or without commentary from Davison). Unfortunately, the audio is out of sync for the theatrical trailer on the disc used for this review (*) – that’s unfortunate but it’s a minor quibble given the generosity/quality of the special features. A nice final touch is a color insert booklet with informative liner notes from Michael Felsher that have just the right touch of dry wit. All in all, Piranha has finally gotten the special edition it deserves – and it’s a must-buy for Dante fans and Corman scholars. (*) Reviewer’s Note: the disc used for this review was the finished product and NOT a test disc. 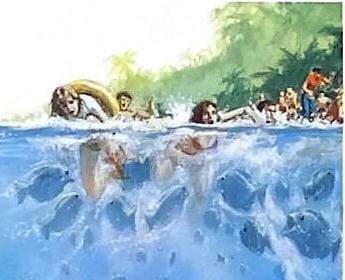 Piranha, publicly acknowledged by Steven Spielberg as “the best of the Jaws rip-offs,” received the Saturn Award Nomination for Best Horror Film in 1979. First time on Blu-ray! 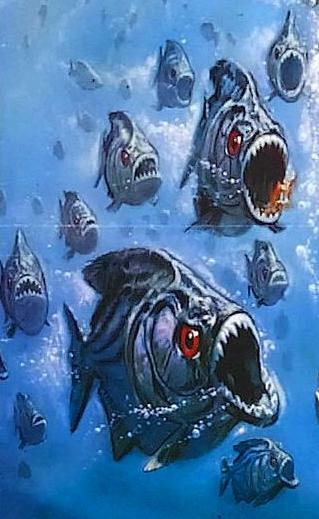 Piranha, publicly acknowledged by Steven Spielberg as “the best of the Jaws rip-offs,” received the Saturn Award Nomination for Best Horror Film in 1979. Next ArticleSchlock-Wire: Get The Motherlode of Genre Ad & Video Release Scans With CRITICAL CONDITION’s Complete Scan Collection! Don, you know I had to pick this one up! I’ll be watching it this weekend.